I find it super inspiring and stunningly beautiful. I have not done a lot of it, but every time I dapple I feel great satisfaction. So it is something I would like to explore more. I have found that since having kids, my time for focused experiences has diminished. Most of my creative pursuits require focused time, so my opportunities to pursue them has also diminished. Now that the kids are getting more independent, I am finding a little more time. But more so, I am finding that if I included them in my creativity, then we all get some nice time together and I get the soul food from being creative. So when Orlando's tooth got wobbly, we discussed some ideas as to what sort of bag/pouch he would like to create. A pretty important item to put his tooth in for the tooth fairy. We decided on felt. I was rather pleased. I find when felting with children the easiest thing to use are pre-felts (where I have created a very basic 'fabric' sheet that is lightly felted and can be cut out into desired shapes). I have a stash of pre-felts from previous felting adventures, so Orlando took to the stash to find some pieces he found inspiring. Once we have cut out the desired shape (much bigger than needed as it will shrink a lot) we add wool, silk, other felt strips and shapes, to the top of the felt to create the design or look that we want. We wet the felt with warm soapy water. Then with a plastic bag on our hand we give it little rubs. This is the bit my kids love, they make all sorts of tickling jokes and have a good laugh about tickling the felt. For Orlando to make a bag/pocket we slipped a piece of plastic inside to stop the front and back from felting to each other. When everything looks like it is going to stay in place, we wrap the felt in nylon cloth (as this wont stick to the felt) and on a rough surface, like a sushi mat or bubble wrap, we roll the felt back and forth like a snake of clay. For the leaves, we select a special stick to attach it to. 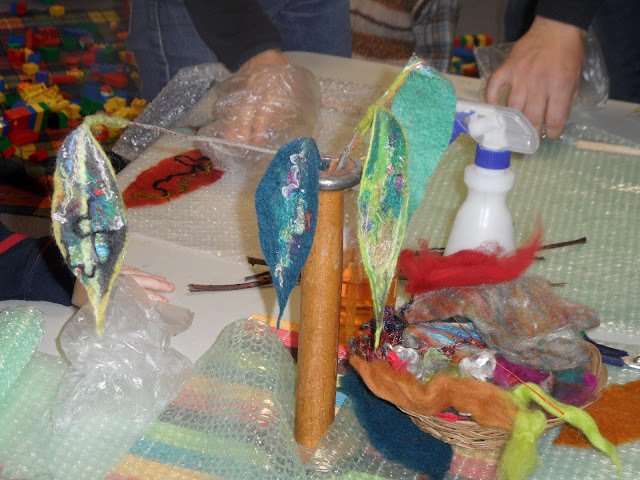 We wrap a little felt around the leaf and stick and gently felt it, so that the leaf attaches to the stick. I love that felt is so diverse. You can make stunning art pieces but also a 2 yr old can create balls, leaves, all sorts, that still look stunning. "Dear Tooth Fairy, My tooth fell out! I think I swallowed it. Love Orlando"
beautiful soph - what does the tooth faery give these days - in my day it was threepence adn the six pence and i used to buy lollies with it! 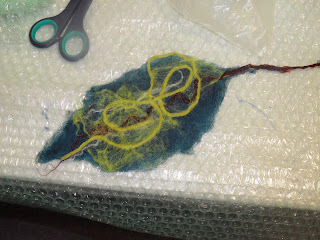 i have just felted with starr and it was most enjoyable - you inspire me to play with all that alpaca woll that i have !